Before joining the TDP I didn’t have any experience of practical archaeology. An Open University basic course online and a week long course at Syon House…. How can I get some experience? The group walked along the length of the site and certain features were pointed out and a general idea of the history of the area was given to us by the TDP staff. We were then split into two groups. 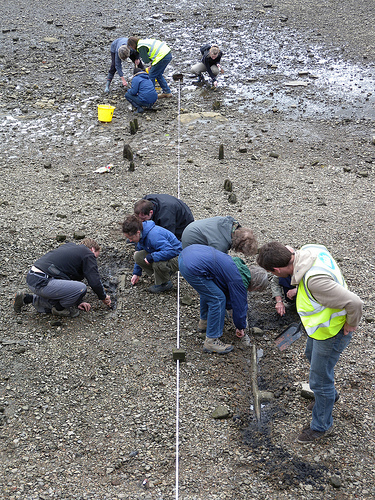 One group’s task was to record the stones of the slipway. A slipway is the way a boat is launched into the water. The other group were recording the wooden remains of a causeway. I was handed a trowel and asked to clear the gravel and silt from the few pieces of wood showing. After a while, long pieces of timber had emerged which formed a rectangle (see image above). This was then recorded for future surveys. I also tried to get my eye in with the dumpy level. This sets the site level and the objects found at their distance above sea level. I didn’t really do very well on this event. Objects were in focus and then disappeared completely. Archaeologists are very patient people, luckily, and it was a ground breaking day for me, literally. After the two days initial training I joined the team working at Charlton. We recorded ships timbers of the 1800’s. Rivet holes, knot marks and tool marks were there to be seen, after having been made so long ago. A maternal ancestor of mine, a gunner, was blown up by enemy shot in 1855, whilst on board the HMS Arrogant. The force needed to get through a timber of their width must have been very strong. During the fieldwork week at Greenwich this year, I was able to see bark left on the wooden piles, as these were only for a ‘temporary’ installation, but the base has lasted 250 years (see image to right). These piles are part of a coffer dam, installed to hold back the Thames whilst the river wall was constructed in the late 1700’s. The ship’s timbers, in contrast, were devoid of bark. The pile that I thought looked like an otter’s head was in fact a pile with part of the branch still attached but I was able to recognise that ships’ planks had been used for the shuttering against the wall. At Strand on the Green, which is on the opposite side of the Thames to Kew, I was cleaning the silt from pieces of wood in readiness to record them. These were about 3 cms thick and they fell into pieces when too much pressure was used. This was new to me. Tracking this soft wood through the mud, I realised that they were woven around the sturdier upright pieces of wood. The outside of the pieces were very fibrous which were pulled easily off the wood. Then I heard the word ‘wattle’ and my mystery was solved. Wattle and daub was used for anything from reed beds to fencing, and the wood used had to be able to be bent but strong. Gradually I am beginning to build on the basic skills and knowledge given to me by the TDP and the working visits from mudlarkers, finds experts from the Museum of London, and English Heritage to name just a few. 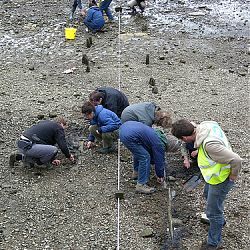 Everyone is willing to share their knowledge with the Thames Discovery Programme FROG members, and discuss their thoughts about the sites we are working on, and I must not forget the archaeological students. 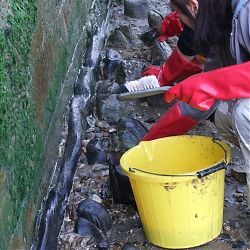 Being at FROG member is a thoroughly enjoyable archaeological activity with the added intrigue of what will the next tide will bring to the site, or take away. 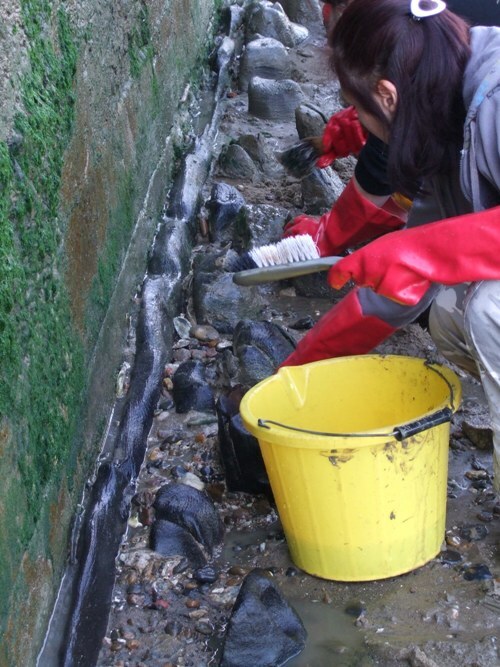 Can we finish this task before it chases us off the foreshore?